Last week, after posting on my little French tart, and the week before that on cuatro leches cakes, I began to wonder why on earth I ordered very expensive French violet petals when our garden is brimming with colorful pansies, Johnny jump ups, and herbs - all of which can be crystallized easily. It was actually Mark's idea. He came in from the garden on Sunday and said, "I don't think the pansies or Johnny jumps will last too much longer as the heat sets in. You should crystallize them for a blog post. They are so much better than store-bought.!" As they say in Italy, "Figuriamoci!" (Go figure!) Why didn't I think of that? 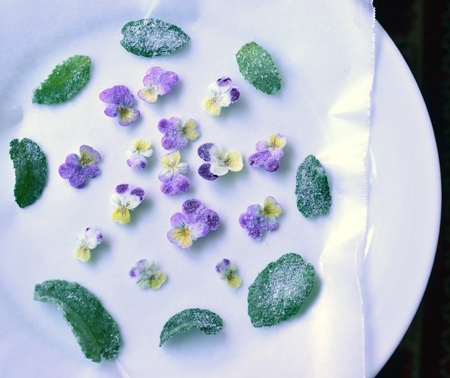 I’ve been crystallizing flowers since my early 20s, when I lived in Upstate New York. I had thousands of violets in my yard - from the purest white to yellow, magenta, blue, "Confederate" (white with grayish-purple streaks ), and deep purple. Violets candy beautifully, but so do many other edible flowers. When I first did it, I used a Martha Stewart recipe that called for powdered egg whites; not a success! Martha failed me - the powdered egg whites clumped when rehydrated, and were difficult to use. So I started using good, old fashioned egg whites straight from the egg. And they worked like a charm. I think that is about it. I think you are ready now to hit the garden and see it through a new lens. A crystal lens! PS - I rarely add a postscript, but this post was photographed with a new 35mm fixed lens given to me by my friends Lee and Lynn. Lee talked me out of my "auto setting" comfort zone and helped me to start looking at objects through a truly different lens (and aperture setting)! I have had a lot of fun playing with depth of field - the first image of the Johnny jump ups in the vase, and then the single Johnny jump up floating in the tiny vase with its blurred friends below are my two favorites! 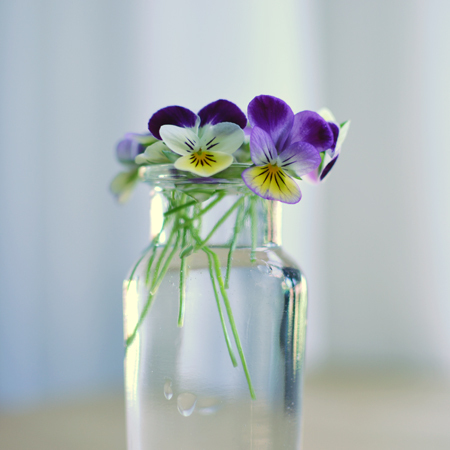 Flowers to use: pansies, violas, Johnny jump ups (heart’s ease), violets, rose petals, calendula petals. 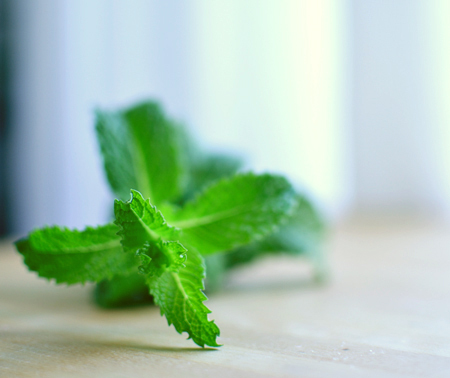 Herbs to use: spearmint, peppermint, thyme. I have thought about trying tarragon, but haven't yet. Pick your herbs and flowers early in the day. Wash them to remove any dust, pat them dry with paper towels to remove excess water, stand them in a glass of water, and let them air dry completely. 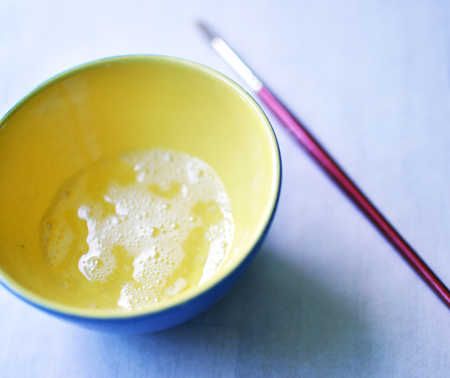 When ready to crystallize, whisk the egg white well. Have sugar at hand, and a piece of waxed paper laid out flat. 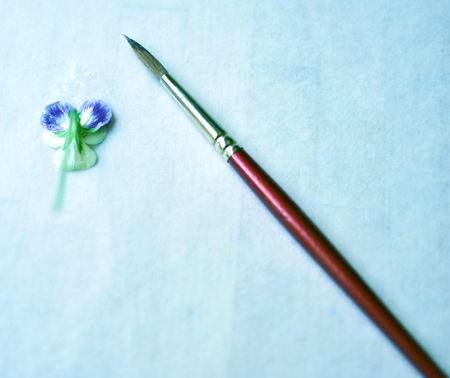 Carefully paint both sides of the flower/herb with egg white. Then, holding the flower/herb by the stem with one hand (this is where tweezers can be useful! ), sprinkle some sugar over both sides with the other hand. Place them on the waxed paper to dry. For flowers, I place them face down first until they are good and stiff, then flip them over to finish drying. By doing this, you are preserving the shape of the flower as they will be seen from the front. This doesn't matter as much with herbs or flower petals. Allow them to dry for several hours, then store in an airtight container between layers of tissue paper for up to two weeks. These are awesome, and can perk up any plate in no time! I will try it with mint leaves or maybe if I buy some edible flowers. I always look at them, and don´t know what to do and think they will just wilt before they reach a plate. I´m happy for your new lens, it will change your vision no doubt. It completely changed mine. There´s so much to do when you start learning some photography, just like it happens in the kitchen. Have a great sunday you guys! I'm happy to have discovered your blog. I have lots of wild violets in my orchard. I'll definitely crystalize some flowers soon...thanks. It certainly seems as if you have quickly developed an expanded comfort zone. Paula - I once (prior to havin the garden) bought some very expensive edible flowers only to have them look horribly wilt on the plate. I am planning on trying different herbs for fun - will keep you posted! Karen - glad you found Cocoa and Lavender! Have fun with your violets! Lee - I have been having SO much fun with the lens - thank you so much! Karin - keep us posted! Maybe one of your new neighbors in Oregon will be THE one! So pretty! Love the arial shot of the jar -- I'd hang it on my wall. I will be doing this with my mint leaves very soon. Valentina - I especially love the mint leaves! So tasty, AND so pretty! David, these photographs are so, so beautiful. 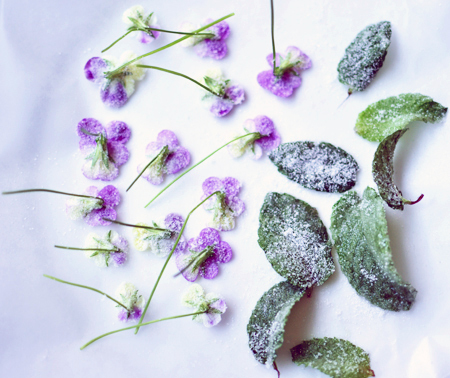 You definitely have an eye for photography and well done with the crystallised flowers. So gorgeous (and delicious too!). 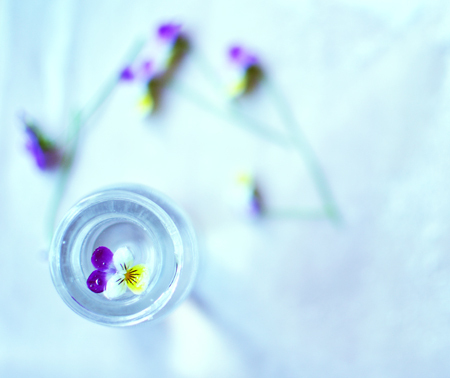 I bought some edible flowers recently from a market... mostly violets and a few others. Over AU$9.00 for one tiny box! They lasted fine (whew! )and looked beautiful throughout the whole champagne breakfast I'd planned but I'd love to grow my own. We only have a tiny balcony at present but you've inspired me to buy some pot plants! How did you learn which flowers were edible? Thanks for being an artistic inspiration, as always. Wish we could be cooking neighbours! Wow! 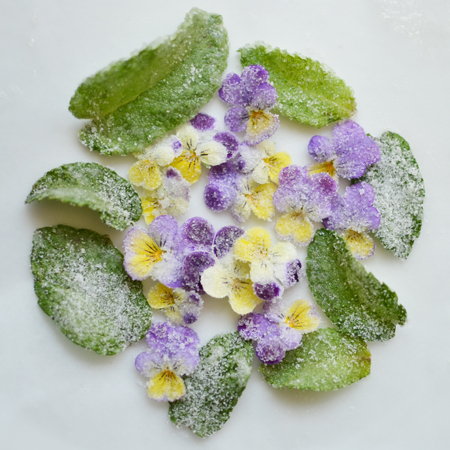 We just had a dessert tonight that was adorned with a oouple of candied violets. We went to The Black Trumpet in Portsmouth, NH and had a most memorable meal. Now, I know how to crystalize them myself! It would be so fun to be cooking neighbors, Laura! Someday I even dream of a trip around the world just so that I can cook and share a meal with all my blog friends around the globe. I would get mighty fat in Australia, I think. We grow most of these herbs and flowers in pots, so I think you will be in good shape if you take that route! Susan, when we next plan your back garden, we will make sure that you include many flowers for crystallizing! The Black trumpet sounds like my kind of place! Thanks, Colette! You really need try this - it is so easy! Thanks, Malli! Glad you enjoyed the post - and thanks for stopping by Cocoa & Lavender! Those are just so pretty. You have out done Martha. 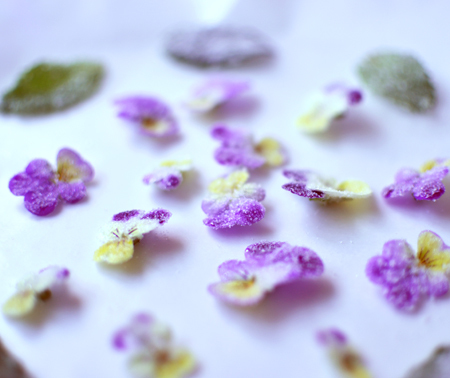 I've never really thought to crystallise flowers, but now that I've seen your gorgeous photo's I'm thinking what I could do when I see some blooms! John - it's worth all the 'oohs and ahs' when people find out you crystallized your own!